The Oakland duo crafts mercurial lyrics and intricate vocal arrangements on its latest album, Devoted. "Whenever I'm here, I'm tempted to buy six, seven, or ten books," said Terra Lopez, browsing the shelves of E.M. Wolfman Bookstore in downtown Oakland. "But spending money on books is something you can never get mad at yourself about." Lopez held up a copy of The Beautifully Worthless by local, queer author Ali Liebegott. It's a collection of poems and letters about leaving everything behind and hitting the road, she explained — her girlfriend's recommendation. "I'm going to need this on tour," she said. 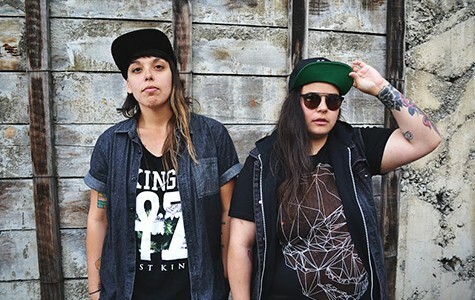 Lopez fronts the downtempo, electronic pop group Sister Crayon. 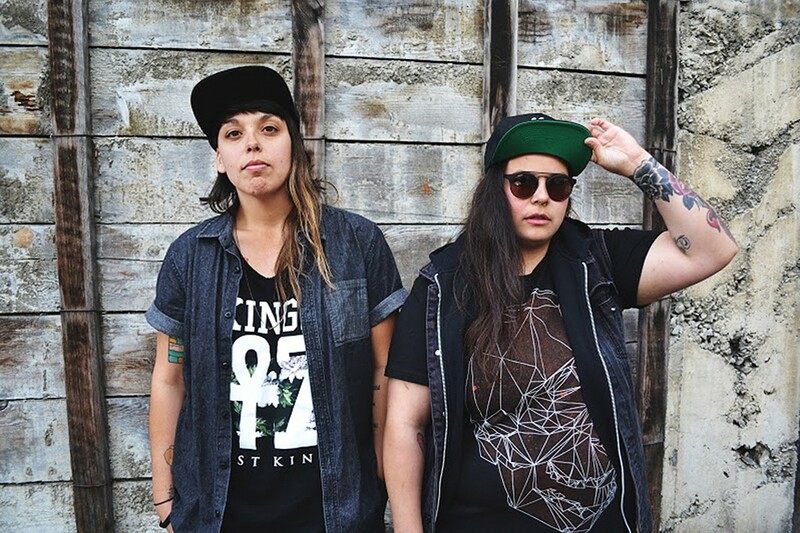 Formerly based in Sacramento, the Oakland two-piece garnered a national audience under the mentorship of Omar Rodriguez-Lopez, guitarist of the influential, now-disbanded rock group the Mars Volta, who runs the label Rodriguez-Lopez Productions. Sister Crayon's label-mates include the Mexican band Le Butcherettes, which the duo will support on a West Coast tour beginning next week. Sister Crayon began as Lopez's acoustic folk solo project in 2007, but she's cycled through a host of collaborators since. Currently, the core members are Lopez and producer Dani Fernandez, though they consider Florida producer and remote collaborator Wes Jones a "silent member," as Fernandez put it. Along with Fernandez and Jones, Rodriguez-Lopez co-produced Sister Crayon's last album, Devoted, which his label released in June. While Sister Crayon featured full-bodied rock songs before, Lopez's expansive vocals assume the foreground on Devoted. Her voice tiptoes to precarious highs, rising from breathy spoken verses to long stretches of emotive falsetto. The beats are minimal; The three producers' combination of understated drum samples and surging, dark synth riffs leave room for Lopez' operatic voice to flourish. Lopez equally weighs heavy-hearted lyrics and the technical aspects of singing. Devoted is a mercurial record about loving tenaciously, to the point that it becomes painful. Throughout the album, her enunciation remains clear, even when she experiments or demonstrates the full capacity of her range. Her exposed vulnerabilities make listeners feel like close confidants. Outside of her lyrical persona, however, Lopez is somewhat of an introvert. Sister Crayon's style of melancholic, vocal-driven pop evolved from her solitary creative pursuits. An avid reader and writer of poetry and fiction, her interest in creative writing predated her involvement in music. Her ability to sing developed during bored afternoons in high school spent emulating singers such as Björk, Billie Holiday, and Fiona Apple in her bedroom. Lopez still views singing as an extension of her poetry. The name Sister Crayon emerged from a fictional letter in her notebook. Lopez signed it "Sister Crayon" and the impromptu moniker stuck. She found that having another identity liberated her from her shyness. "I didn't expect it to be a band ever," recalled Lopez. "I started Sister Crayon as an alter ego for me personally — whether that was music, or writing, or any other performance — and it organically developed." The project began as Lopez singing over classical guitar, but she soon found a creative partner in Fernandez. The two met when Fernandez came over to buy her drum machine. Fernandez was already a percussionist, but hadn't made electronic music. The fateful meeting was an impetus for her to learn. "Terra had a hand drum at her house and asked me to show her what I could do, so I played for her and she was blown away," said Fernandez. "I told her I would teach myself the MPC because I already had the rhythm. Immediately, we connected with me making beats and her writing vocals." Now longtime collaborators, Lopez and Fernandez are tuned in to one another's solitary, idiosyncratic ways of working. They created much of Devoted in isolation — both from one another and the outside world. Many of their songs start out with Fernandez emailing Lopez the skeleton of a beat. The singer spends long hours alone weaving her poems into lyrics, singing lines from her notebooks and improvising until ideas stick. During much of the creation of Devoted, Lopez was in Oakland and Fernandez still lived in Sacramento. The distance wasn't an issue, however, as they both prefer to come together in the studio with complete or near-complete ideas. "When we wrote Devoted, I took like three months off of work and I just stayed in my room constantly," said Fernandez. Communicating over email kept the two artists in sync. In a separate interview, Lopez seemed to concur. "A lot of the time we like to work on music alone because we zone out," she elaborated. "Dani will take like five hours on a song. If I was there, I'd ruin that mood. And vice versa." Watch Rituals of Mine's Gorgeous Video for "Ride or Die"